double in order to prevent the police from using the ID card to discover who is the original and who the nakli [false, duplicate] registrant of the card. A similar theme emerges both within the massive literature critical of UIDAI as well as in the technical and entrepreneurial practices organized in relation to the UID. Take the following article published in October of 2011 on the news blog Firstpost [http://www.firstpost.com/politics/aadhar-indias-vanishing-fingerprints-put-unique-identity-in-question-115144.html]. As usual, I add headings [in italics] to edit and comment on the text. A curious situation has come to light at the UID (unique identity) enrolment centres. Call it the phenomenon of vanishing fingerprints. You see, our unique fingerprints don’t necessarily last a lifetime and they can be damaged or destroyed and, in some cases, even non-existent. And that is not the best scenario for the first-of-its-kind project that endeavours to create a unique identity for India’s billion-plus population based on fingerprints and iris scans (or biometric data). To find out more, Firstpost visited five UID centres in the North West district, which incidentally has the highest enrolments (619,571 and counting) among Delhi’s nine districts since the show hit the road in February 2011, and one centre in North Delhi. The officials at the Unique Identification Authority of India (UIDAI) will tell you that there is no overemphasising the importance of the quality of biometric data to the success of the super ambitious UID, now known as Aadhar project. If the quality of a person’s biometric data is poor, it automatically compromises the authentication of that data by him when he wants to access a service based on his UID. So what happens when the data – fingerprints, for instance – are inherently unreliable on account of various biological and socio-economic reasons, some of which are especially relevant to the Indian context. The findings on the ground were revelatory. Operators and technical experts at the UID enrolment centres confirmed to Firstpost that they routinely came across cases where fingerprints had been damaged/destroyed/underdeveloped. And such cases, they said, were more common among senior citizens, those involved in manual labour (who handle rough objects, for instance) and children (mostly below 10 years of age). The project coordinator of the UID enrolment centre working out of the Destitute Welfare Trust, an NGO in Sultanpuri, too, confirmed that he was aware of the problem of damaged fingerprints and the challenge it posed in getting good quality fingerprint data. “The hands of children are very soft and in some cases fingerprints are not yet fully developed. Also, children tend to have sweaty hands and this can interfere with the quality of fingerprints. Extremely dry hands also pose problems. We have to often, wipe the hands or provide lotion to improve the quality of fingerprints,” said a technical expert working with Strategic Outsourcing. When UIDAI was asked what the percentage of the population enrolled (all India and Delhi) had recorded below-standard fingerprint quality, no specific data was forthcoming. Chaturvedi wrote, “Currently the population with very poor quality fingerprints is a very small percentage. It must also be remembered that this population is scattered all over the country.” In India, even a small percentage translates to millions of people. “Small percentage could mean absolutely anything. Why can’t they be more specific? One percent in the Indian context is 12 million people,” said Abraham. On how the UIDAI was dealing with challenge of poor fingerprint quality, Chaturvedi said, “Even amongst the populace that has damaged/destroyed/underdeveloped fingerprints, chances are very high that they would have at least one good fingerprint that could be used for authentication. Second, UIDAI is also starting to actively develop iris authentication ecosystem. Fingerprint authentication and iris authentication could supplement each other to ensure a universal coverage.” She added that Aadhaar authentication will supplement and work in conjunction with existing authentication systems to strengthen the overall authentication rather than replace completely the existing authentication systems. But if existing systems shore up the degradation of the body, what is the purpose of the degraded promise of Universal Identification? 3) On the rural “proof” for the “concept” of Universal ID: I don’t know much here yet. But in an urbanizing country, and one in which the theme of the duplicate is often linked to the journey to the city, how both technically and ideologically to assess such a claim seems important. Before I go further, I want to begin to lay out some preliminary thoughts on the question of the duplicate I broached in the last post. The film I start with is called, fittingly, Duplicate. It came out in 1998, and stars the reigning Hindi film hero of that time (and arguably since), Shah Rukh Kahn, in a double role. Babloo, the hero, is portrayed as an unworldly and initially childlike figure who is trying to make a break from his mother (“Bebe”) and his family heritage of professional wrestling in order to be a five-star chef catering to urban and foreign tastes. His limit, and as we will see his charm and strength, is his inability to rid himself fully of the telltale signs of a villager to become the modern man without qualities. Babloo makes his way in the world, both aided and delayed by Bebe’s village, unmodern ways. He gets a position as a chef in a five-star hotel. He begins a relationship with the banquet manager, Sonia [Juhi Chawla], who prefers him to her more disciplined and modern colleague in the hotel, Ravi [Mohnish Behl]. Manu, the villain, is Babloo’s physical “duplicate.” After his daring escape from jail, the police begin a manhunt for Manu: he is described as a master of disguise who can take on any rup [form]. In a wonderful scene, the lead police officer shows his men a slide show of photographs of all of Manu’s known disguises: a Catholic priest, a Marwari businessman, and so forth. It would seem that Manu, unlike Babloo, is quintessentially modern: not easily identifiable. And yet he describes himself as a man of certain persistent values: he did not betray his former gang members in prison. These three gangsters, who used the money Manu helped them steal to start a legitimate and clean [sharif] business as a front, lacked such values: they had double-crossed Manu to put him in jail. They now decide he is a threat and must be killed. The worst of these, Shalakho [Gulshan Grover], calls him a behrupiya, a mimic or impressionist. The subtitles on my DVD copy translate this simply as “scoundrel”: the question of form is lost. So Manu is a bit more complex: he can erase identifiable traces, perhaps like a modern. But he carries certain values with him that seem the antithesis of a modernity often marked in the world of popular culture as selfishness. He can pass as anything, and yet these roles and forms are all transient. Unlike the other gangsters, he has no sharif exterior. Shakhalo is not worried about a confrontation with this shape-shifter: he shows his fellow gangsters that his own palm lacks a line of death. Mano evades Sakhalo’s trap and kills the latter’s hit man Tony. The police mistakenly arrest Babloo, until Bebe shows up at the station and berates Inspector Thakur [Tilu Talsania], the low-ranking officer who found him. Bebe brings proof of her son’s identity: a series of family photographs. This, the second series of photographs in the film, is quite different from the earlier slide show. Each photo is keyed in to family events and, as religious devotion is central to the identity of Babloo and his family (from the film’s first scene onward), some show him in relation to the deity, for example on a pilgrimage. This officer, who we are led to see as being like Babloo and Bebe a good and simple person, similarly values kinship: he is the brother-in-law of the lead officer, and continually brings this affinity up in the police station in ways the more professional senior man finds inappropriate. This pairing of more modern versus more simple officer is similar to that between Babloo and Ravi, and the film is suggesting that the good man is he who can maintain some relation both to tradition and more global, “five star,” modernity. The theme is repeated in a scene where Babloo successfully cooks a Japanese dinner for a large Japanese group at the hotel, only to have Bebe show up, find the food too bland, and “helps” her son by adding a lot of spices. Babloo and Sonia expect disaster. But the Japanese guests [who Eric Glassgold informs me are speaking Mandarin] are delighted. If the protestations of a mother’s love and photos linking his face to his family’s and to the image of the deity were enough to identity Babloo and get him released after his first arrest, things get more difficult the second time. Manu, disguised as a television repairman, disarms and kills the first of his three enemies. Shalakho visits the lead officer, having heard that the police let a man go who matched Manu’s description, and reminds him that Manu is a master of disguise. Both men, the modern professional police officer and the apparently sharif gangster, put pressure on Inspector Thakur. Babloo is rearrested. Bebe has gone off on a great pilgrimage, seeking divine favor to fix the problem of duplication haunting her son, not that her photos would have been enough the second time. Babloo, as Mano, is now notorious: his photo appears in every paper. The real Mano, in a conversation with his image in a mirror, decides he must use the fact of his duplicate—the ultimate disguise—to his advantage. But Baloo is in prison and so Manu uses tried and true methods. He kills the second of his enemies by dressing as a beautiful woman and seducing the man to his death. The police now recognize that Babloo, in custody, must be innocent. The senior officer declares him, authoritatively, a duplicate. All the other officers look at each other incredulously, each repeating the English word “Duplicate? Duplicate?” as if it carried specific and technical forensic meaning. Thakur marvels that God [upparwala] must have an amazing “Xerox machine” to have created two such similar men. How then to tell the two men apart? The senior officer seems to have an insight: his face lights up. He tells Thakur to create an “ID card” for Babloo. In the film the card is treated as a novelty, unlike Bebe’s photos earlier. Inspector Thakur gives it to Babaloo in a scene underscoring the friendly kin-based sociality of both men (“Dekh bete yeh tera ID card hai”—look son, this is your ID card). The card is a passport-sized red book. Thakur explains its function. “This ID card,” he tells Babloo, is the only thing that can differentiate him from his double: he is told to secure it and keep it safe. Babloo now feels secure in his possession of the document. He goes home: Bebe should be back by now from her pilgrimage. The camera shows the insecurity of his ID card: the bright red juts out of his rear pants pocket. Mano, not Bebe, is waiting, along with his henchmen. Babaloo tells Manu that the police have given him an “identity card” to prevent them from being confused in the future. He grabs the card from Babloo and assumes his identity. The real Babloo, however, tries to reason his way out of the situation. He tells Manu that stealing his ID card will have no effect. The document has his thumb print: the one sign (nishan) that Manu cannot copy as it is inextricably part of the other’s body. Manu takes a lighter and burns off both of their thumb prints, and then goes to meet and woo Sonia and to assume Babloo’s identity with its privilege (that is, Sonia). Babloo must respond by becoming Manu, convincing both his henchmen and his girlfriend Lily that he is the real thing. The main difference between the men now turns out not to be the moveable ID card but their relationship and behavior to women. Mano does not respect women, either as lovers or as kin. It is Babloo’s respect for Lily that will ultimately turn her away from the path of crime she has taken, leading her to rescue Babloo, Bebe, and Sonia from Manu’s clutches in the final scene by killing her lover. The last scene of the movie shows Babloo and Sonia in their bedroom on their wedding night: the presumption is that now, as a sexually active husband, Babloo can be a little bit of Babloo and Manu. Or conversely, as a wife, Sonia is no longer simply that which must be guarded and protected, like an ID card, to secure Babloo’s identity as the innocent. 1) Failure: Here the ID card is framed as a radical innovation, requiring a pedagogy of use. If it fails, the film moves between the sense of its failure as residing in Babloo’s unworldly and childish innocence, on the one hand, or the sense that such a form of ID (linked to the rationality of the modern senior officer) can never stand in for the traces of kinship and a relation to the deity. 2) Body: The card works through its biometrics: the thumb print. But Manu works around the problem by violently destroying both Babloo’s thumb’s skin and his own. Identity is only as secure as the flesh, and the film suggests that the destruction of flesh is a mode both of criminal action and its accompanying asceticism. 3) Duality: the film alludes to a rich, complex life of the duplicate within the scene of identification. Scholars like Sudhir Kakar have offered national character accounts of the centrality of the film double to a foundational split in the Indian psyche; postcolonial theorists have drawn on many resources to argue instead for the split as the double consciousness of racialized colonialism. In this film, the police are charged with stabilizing such doubledness: marriage, and its claims on women, seems ultmately to do the trick. I begin reflection on UIDAI by arbitrarily taking a point in time–midway through the year 2010, when I had begun noticing an intensification of global reportage on the project–and thinking through a variety of commentaries and observations appearing then. The following short summary is neither an expert nor a particularly detailed account. It interests me as it has moved across multiple websites, ranging from the conspiracy-theory-engaged site Godlike Productions (http://www.godlikeproductions.com/forum1/message1613435/pg1) to the “Tyranny in a Police State” section of The Mental Militia Forums (http://thementalmilitia.com/forums/index.php?PHPSESSID=1bb00298007f37b864ad5ff9503f8686&topic=27190.0). At this point I am not sure what if anything to make of these hosts: my point is not, slyly or otherwise, to assert either that conspiracy theory is needed here nor conversely to denounce such concern as paranoid. Rather it is to suggest that talk about UIDAI, at least on the Internet, often comes bundled up with other things: specific narratives, specific knowledges, specific hermeneutics, specific affects. The piece appears to be authored by Aaron Saenz of the futurist science news site Singularity Hub (http://singularityhub.com/2010/09/13/india-launches-universal-id-system-with-biometrics/) and was published September 13, 2010. India has launched an ambitious program to fit each of its 1.2 billion residents with an Unique identification number (UID). Each number will be tied into three pieces of biometric data: fingerprints (all ten digits), iris scans (both eyes), and a picture of the face. Starting this month, the Unique Identification Authority of India (UIDAI) will begin processing people in various locations around the country. 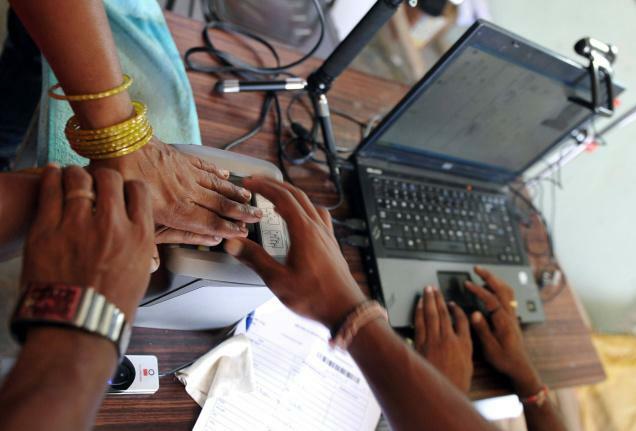 UIDAI aims to slowly roll out the program through February of 2011 and to ID 600 million people in the next four years! This is a mammoth program. While residents are not mandated to get a UID, a growing list of services including social welfare and even some bank accounts will soon require the identification number. If successful, this will be the first biometrically verified universal ID implemented on a national scale. India is forging new ground, drawing both fears and hopes of what a national ID number may bring with it. 1) The primary agent of this development is framed as the nation state: “India.” Thus, “India has launched an ambitious program….” UIDAI is here not differentiated from the nation-state, despite its particular mix of “public” and “private” resources, expertise, and claims for governance. We might call the implicit political theory here neo-Samkhyan. Samkhya is the one of classical Sanskrit’s six legitimate schools of darsana, insight or philosophy, that focuses on the emanation of forms from some primary figure of form, energy, or nature, prakrti. Emanations clutter the universe, forcing us into a process of discrimination to achieve clarity. In this web item, however authored, there is a primary source of form, the nation-state, and from it emerge new institutions, here UIDAI. This framing of “neo-Samkhyan” is provisional at best: what I am attending to is first, an implicit and presumptive form (emanation). If I borrow from the lexicon of the classical Sanskrit cosmopolis, it should be but is probably not obvious that the intent is neither to assert some transhistorical structure of thought or semiotics (“India”) nor to address the state of mind of either this author nor his sources. One works to specify form through analogy, requiring choices. There is a politics to such analogy. In any event, at the outset, we face the problem of origins in a particular way: what are the uses, and limits, to framing UIDAI as an institution of and from the nation-state? 2) A lot of body parts are needed to produce the assembled collection of biometric data “tied” to each UID number, at least according to this account: two eyes, ten fingers, one face. This plenitude (thirteen, an unlucky number in a different world) of parts is worth mulling over. We will I imagine find that the technical regime of universal identification, its procedures and algorithms, may be somewhat more complex than a simple list of thirteen body parts as traces or data points. Much of my own work for some years has wrestled, in a different set of global and Indian contexts, on what is a body part. But the simpler questions generated here are of labor (in order to produce traces of all 13 parts for hundreds of millions of persons), error (given the magnitude of the assembled traces at the national scale), and lack (given that not all persons will have 13 traceable parts: some will have less or more fingers, or burnt fingertips, or missing eyes). In popular Indian film (I will come back to this), identification has often set against the problem of the “duplicate,” someone else who looks exactly like oneself. After I announced the blog on Facebook yesterday a friend wrote to remind me of the very real dangers of duplication: I will address his comments if I can in a later posting. The magnitude of parts here seems like a shoring up, effective or not, against the danger of duplication. The elaboration, “politically,” “culturally,” of what I am calling such a danger of duplication may need to be a key theme of the blog. 3) This project is framed as both singular and emergent: it is a “first” and it is “new.” This newness may be not only obvious but worth taking seriously. But it is, certainly in the kinds of websites that circulate this news, haunted by other, earlier projects of securing and distributing through universal identification. As emergent, the project seems to carry a doubled affect: of fear and of hope. The pairing may or may not be a cliché: how one reports, on websites dedicated to the future. So, at the outset: one nation, 13 parts, 2 affects.